Thank you for visiting the Neshoba County website. We hope the information here will be helpful. This site has been created as a public service to give you an overview of the functions and services provided by Neshoba County governmental units and elected officials. Please contact us if you have questions or if we can be of assistance. 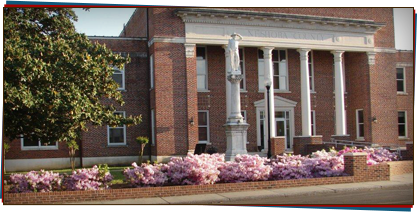 Neshoba County was established by the Mississippi legislature on December 23, 1833. The word Neshoba is believed to be derived from an Indian word for wolf. Philadelphia became the county seat of Neshoba County on August 15, 1837. The Pearl River, which flows east to west through Neshoba County, was an important waterway for early settlers, especially between 1830 and 1860. It reportedly took 15 days to travel by keel boat from Philadelphia to Jackson and about 30 days of vigorous labor to bring a keel boat upstream from Jackson to Philadelphia. Federal Colonel Benjamin Griersons grandstanding expedition through Neshoba County in the spring of 1863 was the only significant action of the Civil War near Philadelphia. However, hundreds of Neshoba County men were killed in battle, died from the fevers that plagued Civil War camps, or were maimed for life by federal shot and shell. In addition to the human loss. , Neshoba Countians also lost tens of thousands of dollars in precious hard currency invested in Confederate bonds and other financial instruments that were worthless when the rebellion failed. Share-cropping and other forms of hard-scrabble farming characterized the post-war years in Neshoba County. The one-mule farm became a standard operation. By 1880 the countys natural timber resources were becoming an important economic factor, and by 1910 Neshoba County sawmills were too numerous to count. Today, modern industries and representatives of some of Americas blue chip companies have become mainstays of the local economy. Local business people have continued to develop Neshoba Countys timber and land resources for the benefit of their investors and hundreds of local people employed in forest products industries.